When Windows 8 shipped without a start menu and forced anyone to use the full-screen Start Screen view instead to switch between it and the desktop regularly, third-party start menu replacements started to appear left and right. Probably the (commercially) most successful one was Start 8. It was first offered as a free beta but later turned into a paid product. The start menu replacement and many competing products allowed Windows 8 users to display a start menu that resembled the Windows 7 menu. Microsoft announced shortly thereafter, after it became clear that Windows 8 would not be the system seller and entry in the tablet market the company hoped it would be, a re-introduction of the start menu in Windows 8.1. Users were happy until they saw the menu for the first time. Instead of bringing back the Windows 7 start menu, Microsoft launched one that linked to often used programs and features but was not sufficient for the likes of many desktop users. So, all was good for the makers of start menu replacements. The start menu in Windows 10 is Microsoft's second attempt at bringing back a start menu and while it looks more promising, it is still not the Windows 7 start menu that many users hoped it would be. That's good news for companies who produce start menu alternatives. 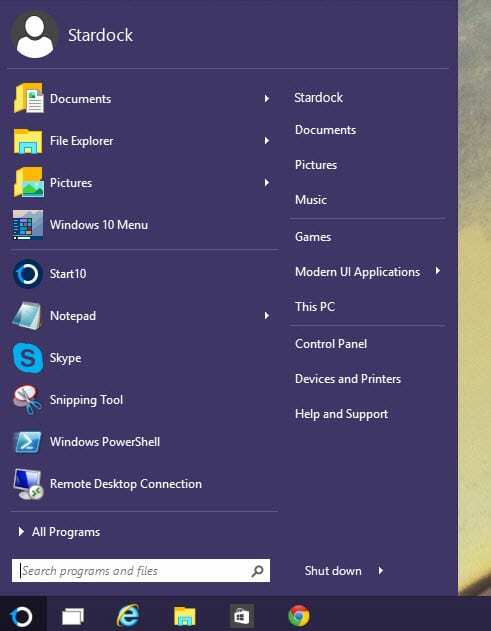 Stardock just launched Start 10 as a private beta for users of the company's Object Desktop applications. The company is not the first to release a replacement start menu for Windows 10 though. Classic Shell, a free program released an update last year that made it compatible with the Windows 10 operating system. Start 10 works in many regards just like Start 8. 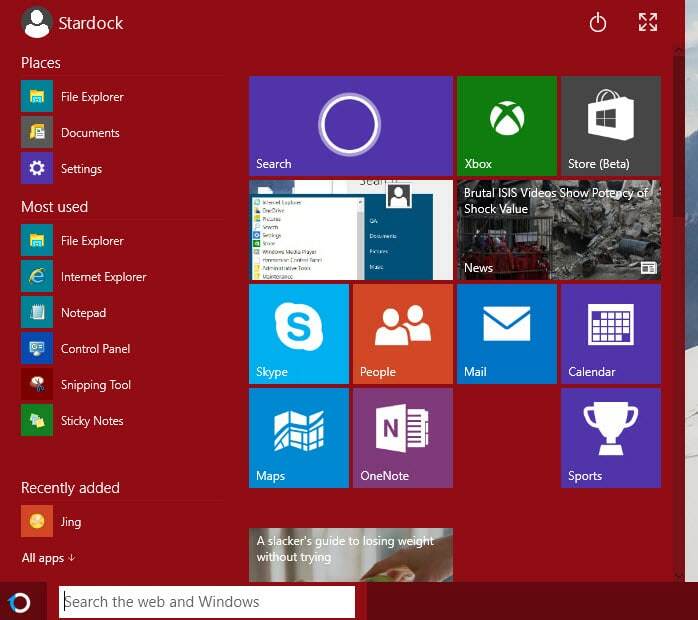 After you have installed it you get to pick a different layout for the start menu. The program features the classic Windows 7 start menu and a themed Windows 10 start menu right now. You switch styles in the configuration. There you find options to switch between both menu themes and modify a selection of start menu related features such as enabling or disabling menu translucency or selecting a different Start button that is displayed in the taskbar. If you are an Object Desktop subscriber you can download and install the start menu right now. Note that it requires the Windows 10 January build 10.0.9926. Start menu replacements will certainly retain some of their popularity on Windows 10 but it is unlikely that they will make as of an impact as they did on Windows 8. The Windows 10 start menu in its current form may not be ideal but it is customizable to some degree. If you don't use apps, you can simply remove all of them from it so that they don't show up there. 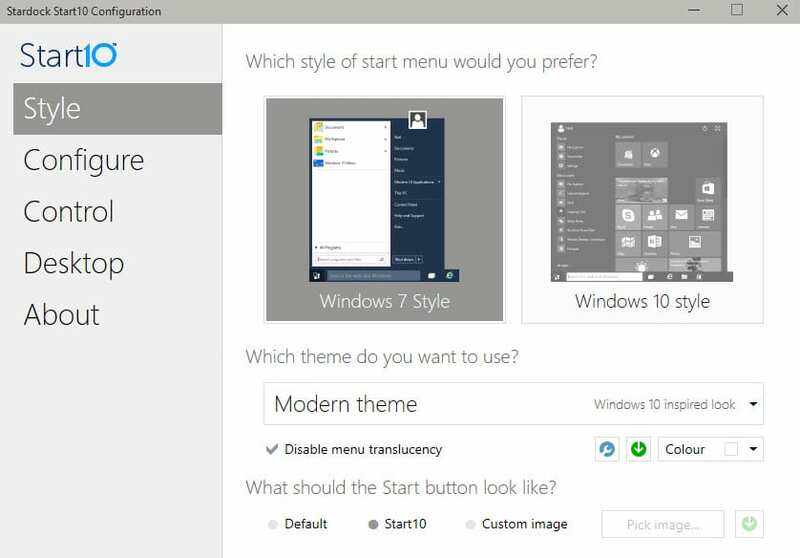 Stardock launched a private beta for Start 10, its start menu replacement application for Microsoft's upcoming operating system Windows 10. I cannot really say, have installed Classic Shell recently. I have the same issue. I reported it using feedback. Hopefully they listen. You should too! The more, the merrier. Total waste of space. You didn’t actually reply to anyone in this case, btw. Iobit’s Start Menu 8 looks exactly the same and works the same for free. I’m using it in Windows 10 now. What don’t people like about the Windows 10 Menu? Personally I really like it. I have no time for most of the modern apps but I just remove that stuff and repopulate the space with stuff I do use. Classic Shell is the best one. Don’t bother with other paid or free apps. I have Win7 in a VM with Classic Shell. I think MS should just stick to a simple menu and encourage Stardock etal. who can afford to specialize in specializing, as it were. Makes for more variety. Especially with all the different hardware 10 can end up on.